Oops, I'm a day late posting this! I have a very good excuse though- I was super busy yesterday baking and cooking for and going to a family reunion at my mom's house. I was up really early and running around my apartment trying to get everything together. I made this tart as one of the desserts for the family reunion. It had a lot of steps but was really very easy to make! 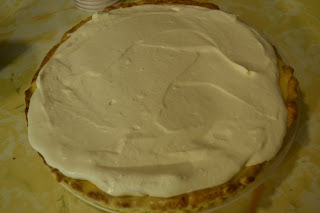 I made the tart dough and the orange creamsicle curd on Friday and refrigerated both for a few days. I baked the tart dough yesterday and whipped up the orange creamsicle curd as directed in the recipe. I also made the whipped cream (using a mixer, because I just didn't have time to do it by hand). 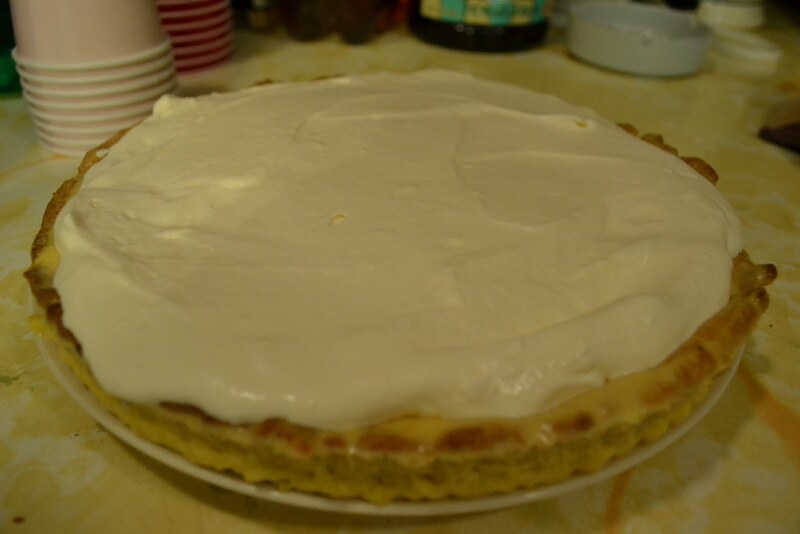 I filled the tart with the orange creamsicle curd and then tried to leave to go to my mom's house. 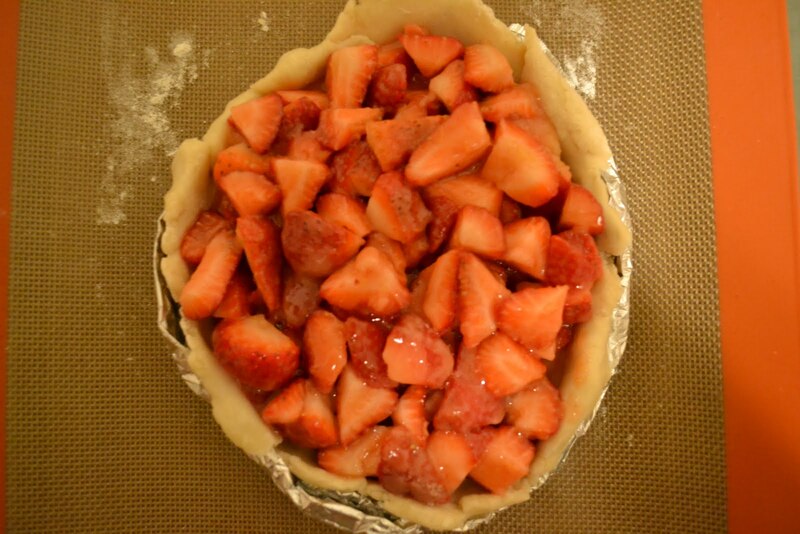 I put the tart in a box because I saw that it was pretty full. Well, luckily I had extra filling that I brought with me, because a lot of the filling spilled out of the tart on the ride to my mom's! 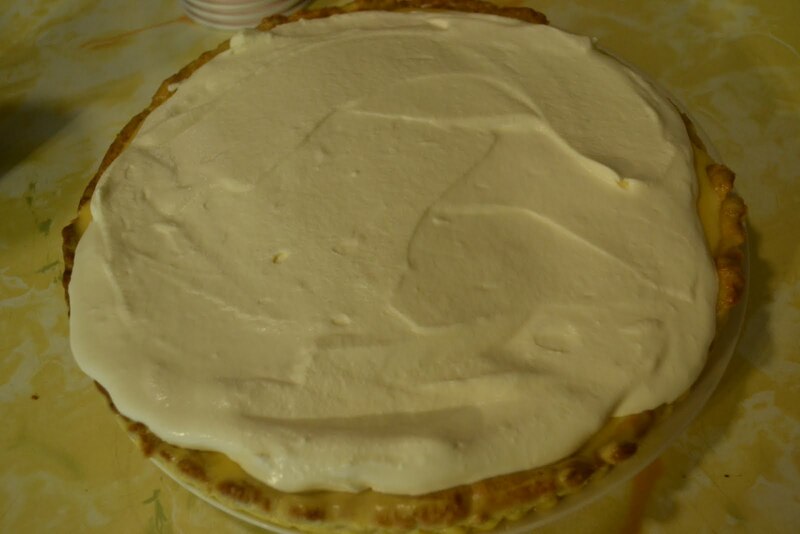 So, when I got to my mom's, I fixed the filling problem and covered it with the whipped cream topping. It refrigerated for another few hours until it was time for dessert. I'd say that this dessert was pretty well received. I loved it and so did my mom, who is a huge fan of orange creamsicles! 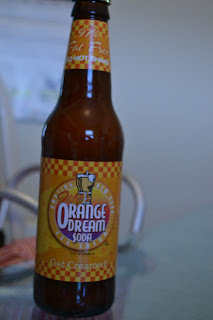 I had some left over and tasted it- it was good, even though I'm not a soda drinker! 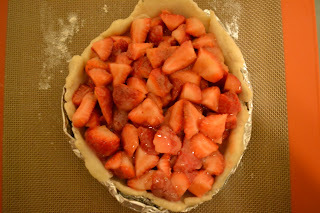 The only complaint about the tart was that the tart crust was very hard- difficult to cut! I think that was my fault for not rolling out the dough thin enough- this is not the first time I've had this problem! 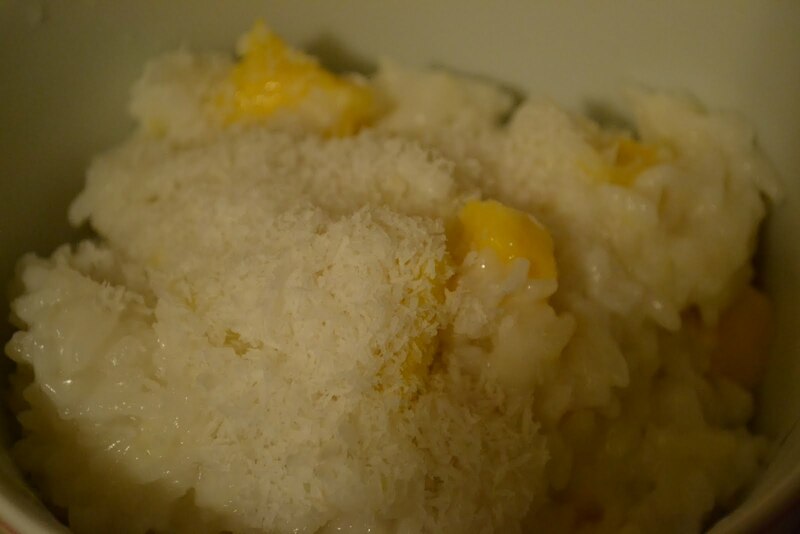 When I saw this recipe for coconut rice pudding, I had to make it immediately. That night. After a long day of work. I've always liked rice pudding but only made it once before. 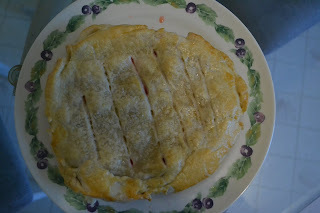 I looked at the recipe and saw that with a few alterations, I had all the ingredients at home and wouldn't have to run to the grocery store. The recipe called for forbidden black rice, which in the picture, looked a little scary. I decided I could substitute good old jasmine rice. The recipe also called for kiwi, which I don't really like and didn't have in my refrigerator, so I left that out. This pudding was delicious warm and chilled in the refrigerator! (Slightly changed; original recipe from Whole Foods Market). Put water and rice into a medium pot, cover with lid and bring to a boil. 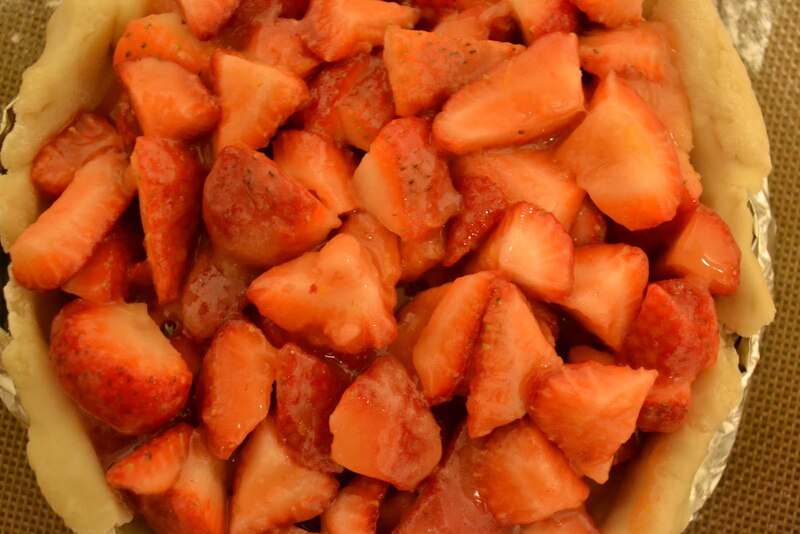 Reduce heat to low and simmer until all of the water is absorbed, about 20 minutes. 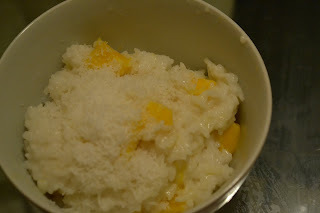 Uncover and stir in coconut milk and sugar. Bring pot back to a simmer and cook, uncovered, for 5-10 minutes more. Stir in chopped mango. Top with unsweetened shredded coconut. 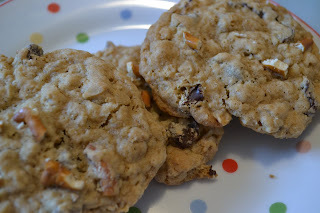 This week's recipe is for cowboy cookies! I have to say that I've always been a fan of chocolate chip cookies that add in all different kinds of fun flavors. So it was surprising to me that I wasn't a huge fan of the compost cookies from Momofuku Milk Bar. But anyway, I was excited to make these cookies when I saw that crushed pretzels were one of the ingredients! I love salty & sweet together. This recipe also called for espresso powder and oats, in addition to chocolate chunks. I used chocolate chips because that's what I had. I probably should have left out the espresso powder because I'm not a huge fan of coffee flavor, but everyone else who tried these cookies loved them! I brought them to work and my co-workers gobbled them up. Even my mom liked these cookies and she usually doesn't like many sweets. These cookies were really easy to make. As usual, I made a half batch. One difference was that they called for cool butter instead of room temperature butter. This was easy for me because I usually don't leave enough time for my butter to come to room temperature anyway when I'm baking. The recipe also called for chilling the dough for 4 hours in the refrigerator but I have to confess I got impatient and only chilled them for an hour and a half. I don't know how much of a difference that made though. These are a nice and easy cookie to make and the somewhat unusual combination of ingredients is something that most people enjoyed! 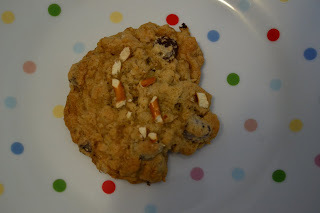 To see the recipe and how everyone else's cookies came out, head on over to Baked Sunday Mornings. 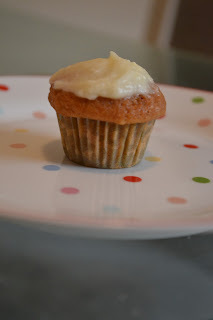 Wow, when I saw that this week's recipe was for tomato soup cupcakes, I didn't know what to think. Tomato soup, in a cupcake? I love my cupcakes, but I wasn't sure about this one. I've made cupcakes w/bacon before (not on the blog) and those came out well, so I figured that a cupcake with an unusual ingredient could have a chance at being tasty. These cupcakes were really easy to make with my stand mixer. I made these cupcakes in a mini-cupcake pan and I also made 1/4 the recipe because I didn't know what I'd do with 2 dozen cupcakes. As it was, 1/4 the recipe made 16 mini cupcakes. Since I made mini cupcakes, I baked them for about 16 minutes. The frosting was also super easy to put together and I went for a rustic look by using my offset spatula to frost the cupcakes. The cupcakes are a very light red and you can't really taste the tomato soup part of it. 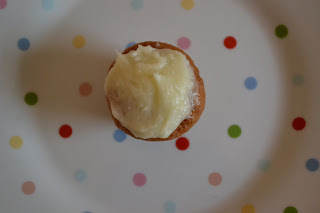 It really tastes just like a spice cupcake, and I was pleasantly surprised! Happy Mother's Day to all the mother's out there! To find the recipe and read how everyone else's cupcakes turned out, head on over to Baked Sunday Mornings. Enjoy! Happy Easter to everyone who celebrates! What is everyone cooking/eating to celebrate today? 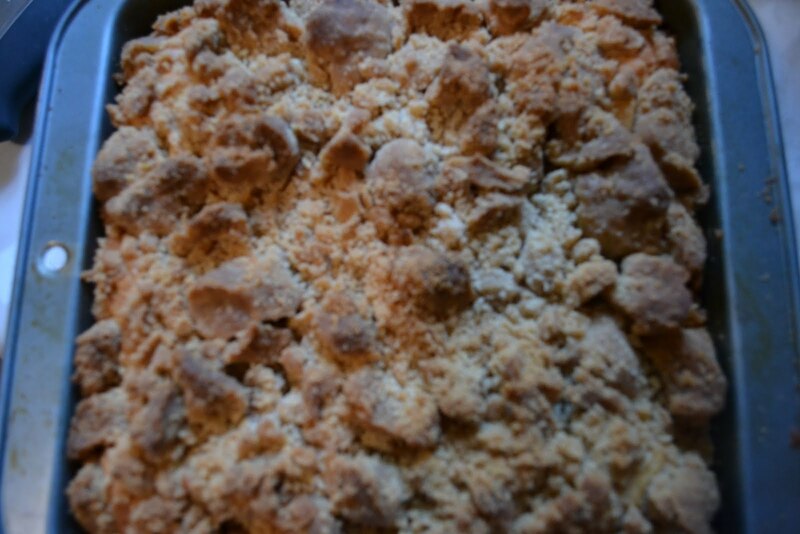 This New York style crumb cake had a lot to live up to, as my parents are both originally from New York and I have eaten crumb cake many times growing up. This cake came out beautifully! We haven't actually eaten this cake yet, as it will be our Easter dessert. My family is going to my sister's house today- we're having ham, pot roast, mashed potatoes and asparagus. 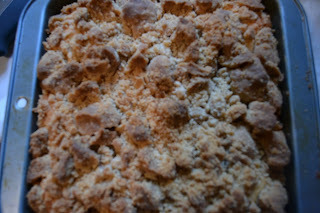 My mom and sister are very excited for this crumb cake- I hope they can last until after dinner to cut into it! This cake was very easy to make. I made a half-batch since we're not expecting too many people for Easter. I baked it in an 8-inch square pan and that seemed to work out well. 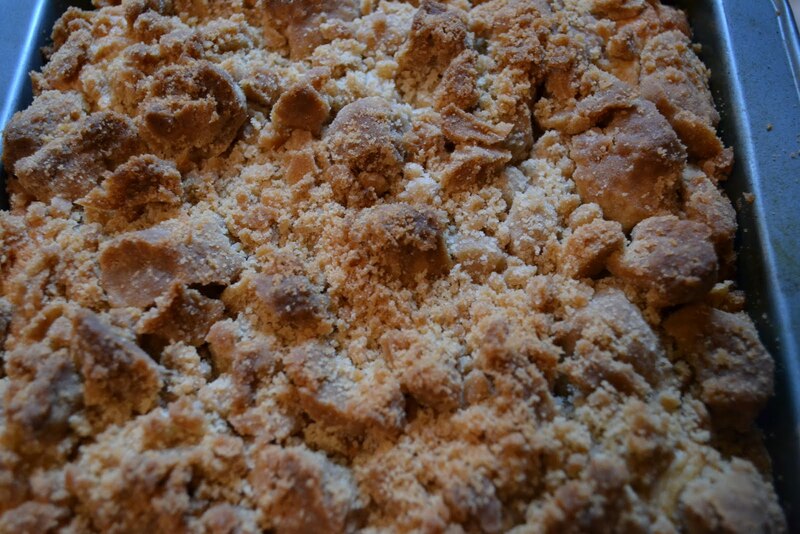 The cake batter comes together easily and the crumb topping was even easier to put together! 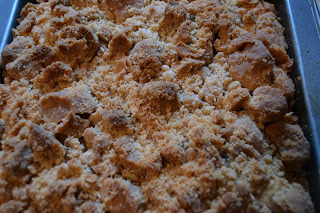 It was important to follow the recipe directions to let the crumb topping "rest" for awhile before putting it on top of the cake and baking it. I let mine rest for about half an hour and I could tell the difference in how it was a little dryer and came together in big clumps in my hand. The recipe states that big crumbs are integral to this recipe and I certainly had many big crumbs on top! Some of my crumbs came out a little smaller, but I don't think that's too much of a problem. To hear how everyone else's cakes turned out, head on over to Baked Sunday Mornings! I've long wanted to bake something with carrot. 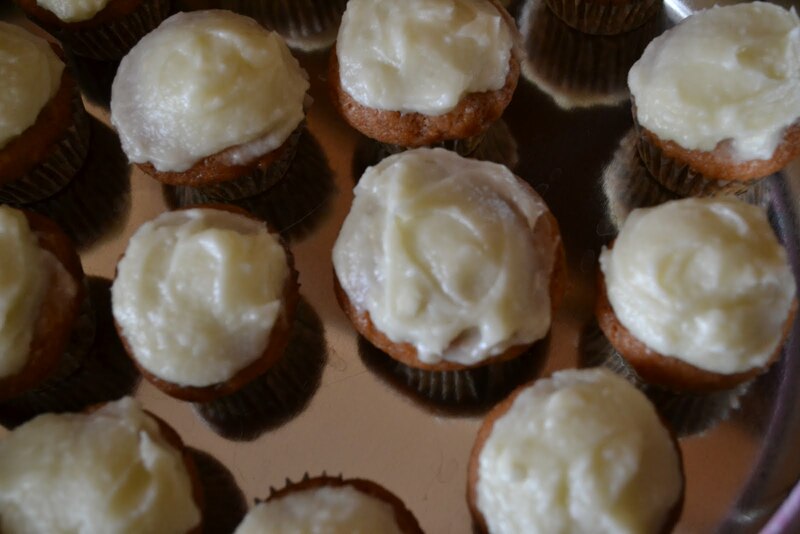 I've never made carrot cake or carrot cupcakes because the idea of having to shred carrots intimidated me and I just never got around to trying a recipe. I'm so glad that Baked Sunday Mornings challenged me to make another recipe that I probably would never have tried. 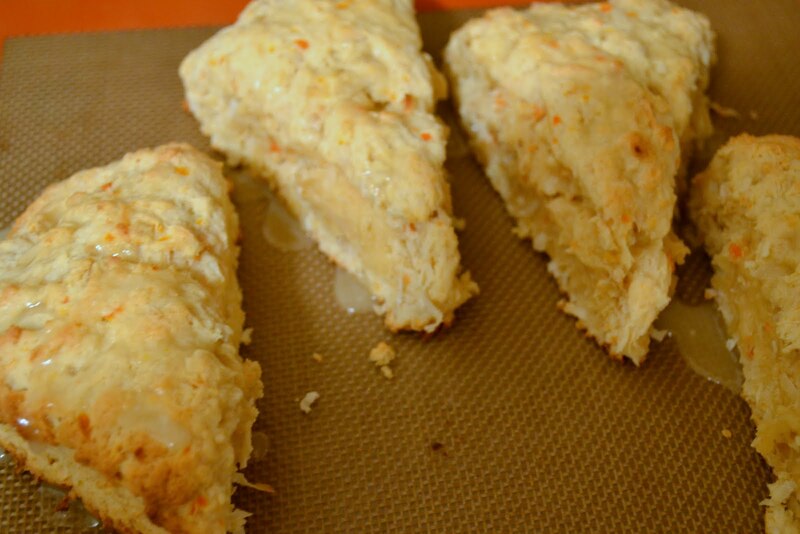 This was a fairly easy scone recipe to make. 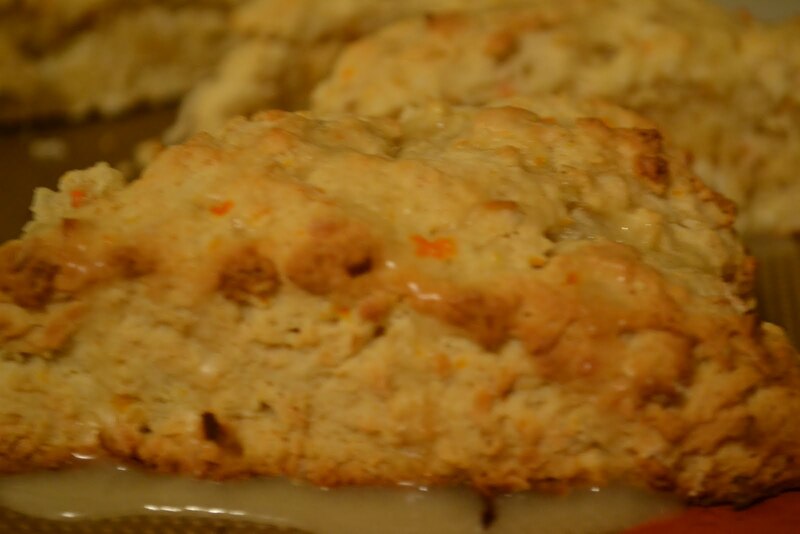 I didn't have to shred any carrots because this recipe calls for microwaving the carrot in orange juice and then pureeing it before adding it to the scone recipe. The recipe also called for using your fingers to rub in the butter into the dry ingredients. I usually use my pastry cutter for doing this but this time I decided to follow the directions and use my fingers. It seemed to get the job done quicker, although my hands were a lot messier! You then add in the wet ingredients and again use your hands to knead it all together. My dough seemed pretty sticky, but it was workable. The recipe said to cut the dough into 6 or 8 pieces. 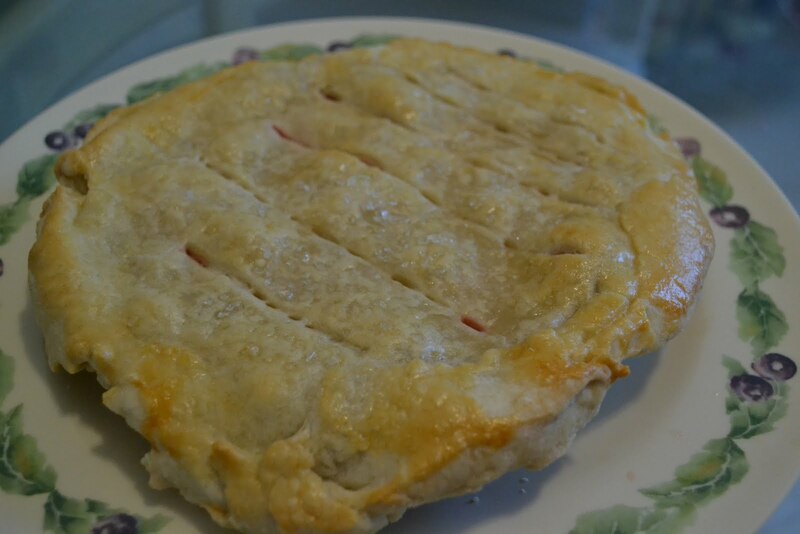 I cut it into 8 pieces and froze 4 of them unbaked to bake at a later time. 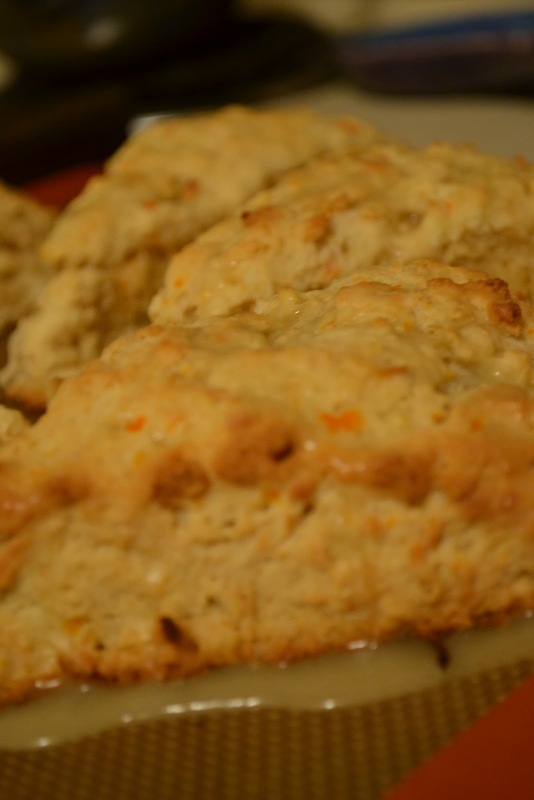 These scones came out so huge that I probably could have cut them in half again before baking! After cooling, you mix up the citrus glaze. The recipe called for powdered sugar, orange and lemon juice. I used only orange juice, because that's what I had. The scones were good but seemed very sweet. I definitely couldn't eat a whole one at once. The recipe used sweetened coconut but if I made them again I might use unsweetened coconut to see if that cut the sweetness at all. I brought these to work and my co-workers shared them and seemed to like them! To read how everyone else's scones came out and to see the recipe, head on over to Baked Sunday Mornings. Enjoy!